Rabbit Stew: On the way to Tesco: Food for Free? I was on the way to Tesco's a couple of weeks ago, walking through the town park and over the river to get there. There's a fairly unattractive concrete bridge over the river and underneath the unattractive bridge are a collection of ducks, doing their ducky thing. 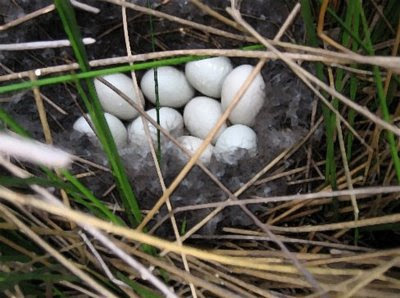 Half way over the bridge I noticed that, tucked in beside the river in among some reeds, was a pile of about half-a-dozen, bright blue, freshly laid duck eggs. In my pocket was a small piece of paper with "loo roll, tea bags, veg, eggs" written on it. I was fantastically skint at the time and I thought to myself, Well, why don't I just climb down there and take those eggs? I looked at the eggs and I pondered it. I looked at the people walking back and forth over the bridge - on their way to Tesco's, coming back from Tesco's - and I thought about how it would look, me clambering down to the riverbank to take these duck eggs. Nah, I thought, too scary. I went to Tesco's and I stood in front of the egg shelves: Duck eggs, Free Range eggs, Organic Free Range eggs, Omega Blah-Blah Enhanced eggs - eggs, eggs and more eggs. I bought the anonymous, cheap and shameful Eggs from Caged Hens. I did this because I was, as I say, terrifically skint and also, I confess, because a part of me thought, Oh bugger off with your ****** Organic, ******* Free Range, ****** eggs - I can't be doing with two quid for six ******* eggs! I am fully aware that purchasing said eggs, even in times of financial hardship, makes me an ethical criminal, not fit to show my face amidst my Guardian reading, hen-cruelty-abhoring, liberal peers. But there you go; I like nuked eggs on ketchupy toast; I couldn't - at the time - handle paying two quid for a box of eggs; so I bought them. So - as they say - sue me. The next day I walked across the bridge again - back to Tesco's, no doubt - and the duck eggs had disappeared! Someone, I guess, must have looked at those eggs, looked at Tesco's over the road, and then thought, Well yes, I'll have those free eggs, thank you very much. I pondered the vanished eggs and tried to reach a conclusion on the matter of what I'd done and hadn't done. No conclusion offered itself; I went to Tesco's.